I along with Joel Truckenbrod will be presenting at a symposium entitled Capturing the Essence of Place at the Minnesota Landscape Arboretum on June 12, 2010. We will be showing some of our favorite photographs and discussing what we decided to shoot to capture the essence of the location. Additional information and registration information can be found at the Minnesota Landscape Arboretum website. Please join us for a fun day and stay to take some great photos. I just received word that one of my photos entered in the Wisconsin Great Lakes Photo Contest was awarded second place in the People Enjoying Wisconsin’s Great Lakes category. 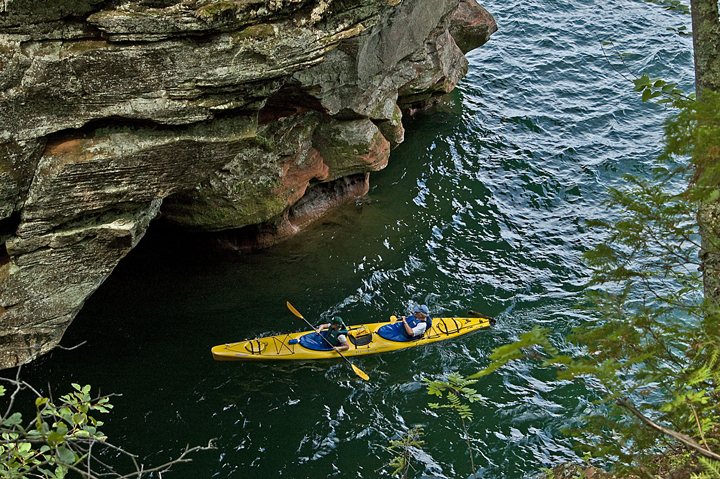 The photo is of two kayakers entering the Apostle Islands Sea Caves. I just returned from a trip the Michigan’s Upper Peninsula. 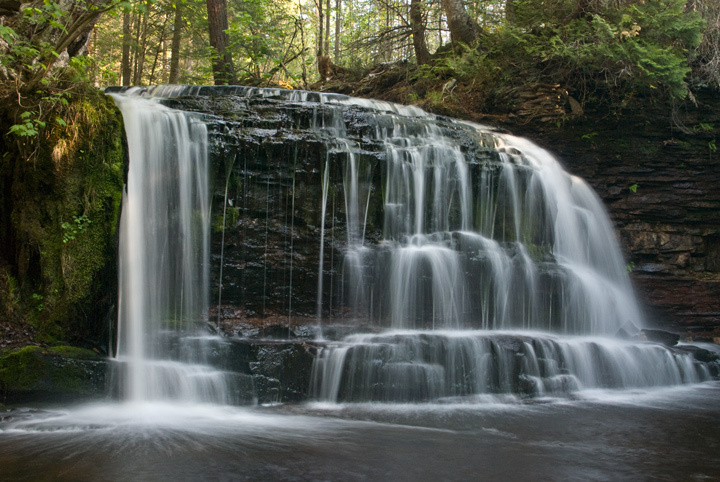 Most of the time was spent around the Munising area revisiting a number of popular places including Pictured Rocks National Lakeshore and a number of waterfalls. On this trip I did visit a beautiful but hard to find water fall called Rock River Falls. I spent several hours photographing the falls. I arrived just as the sun was reaching the falls so I missed out on a few shots with the entire falls in the shade. 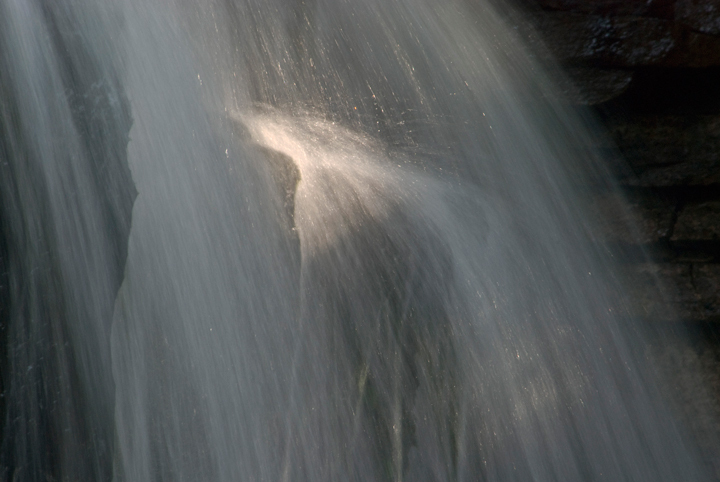 However, the sun provided some interesting photo opportunities as it hit various parts of the falls. This can be a difficult falls to find so I’ve provided some detailed driving instructions on my website along with additional photos. The trail to the falls is less that a mile but it can be very boggy in places so I would suggest wearing some rubber boots for the walk in. Boots also help if you are going to be doing photography because some of the best shots require wading in the stream. I spent yesterday hiking on the circle trail north of Bloomer, Wisconsin. I started at the visitor’s center and hiked the trail counterclockwise. It started off as a cold cloudy overcast day but changed to partly cloudy and warm by the end of the day. The water levels in the small ponds along the trail were the lowest I’ve seen since I started hiking in the area. Northern Wisconsin is in the midst of a 7 year drought which doesn’t seem to be ending. My intent was to photograph birds and flowers but as it turned out I saw few birds because of the dense foliage. I hopped to photograph the Blue Herons at their rookery but the overcast and lack of activity didn’t present anyopportunities. The rookery is just north of the parking lot on county M. The prime location for photographing them is at the edge of a small pond but it has become more difficult to photograph them because many of the trees along the edge of the pond have died and blown down in recent years so they are nesting further away. On the other hand there were lots of flowers out along the trail. Large-flowered Trillium Downy Yellow Violets, Ferns, Early Meadow Rue, Large-flowered Bellwort, Pussytoes, Wild Oats and Star Flowers were common. Between the strong wind and the changing light conditions it was difficult to get many good photographs. 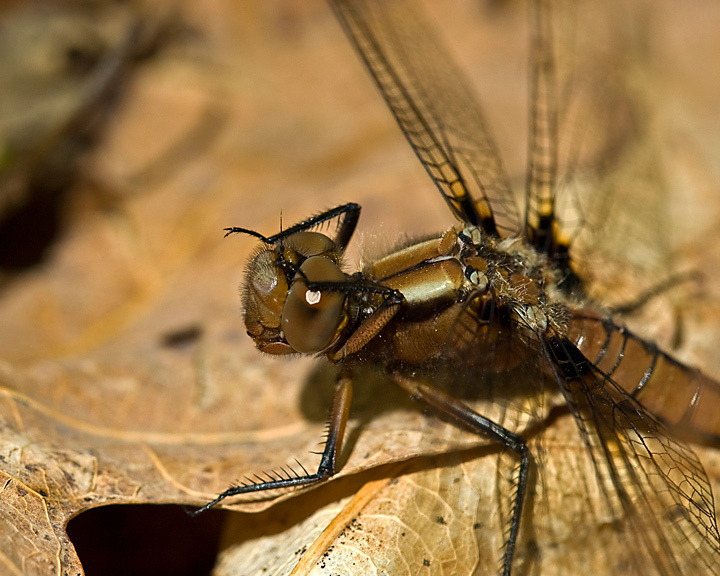 There were also large numbers of dragonflies along the trail. There are lots of flowers along the trail. The Large-flowered Trillium is still out in numbers but they are starting to fade. The Wild Blue Phlox and Wild Geranium are now out in numbers. 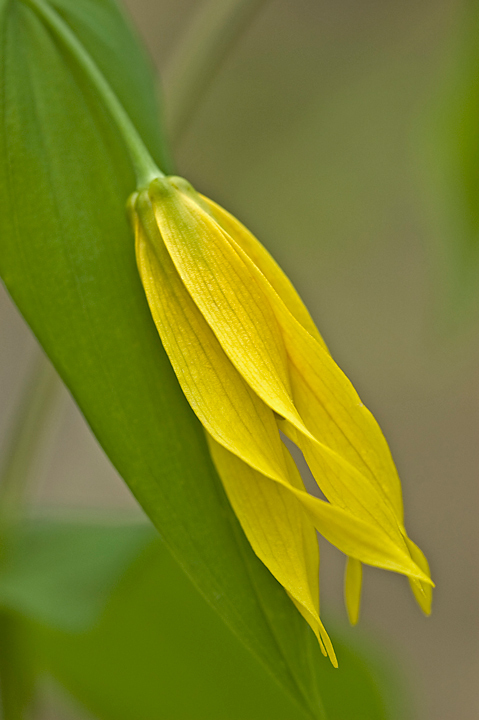 I also noticed Swamp Buttercups, Nodding Trillium, Wild Ginger, Common Blue Violets, Ground Ivey, Jack –in-the-Pulpit, and a number of other flowers. 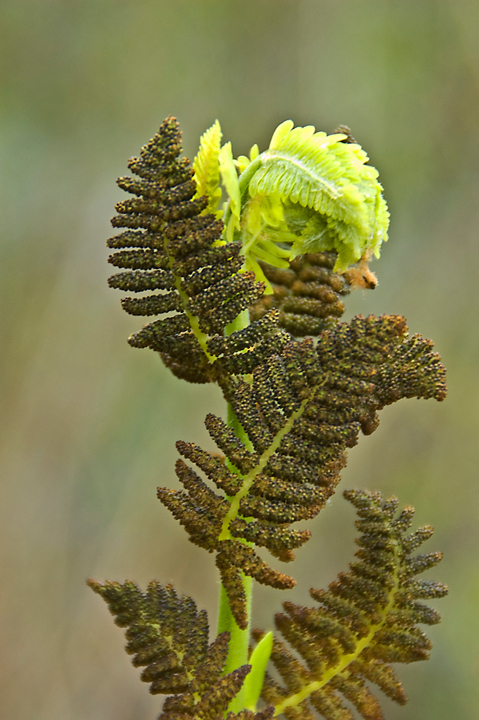 There are a variety of ferns out along the trail although it looks like some of them may have been frostbitten. 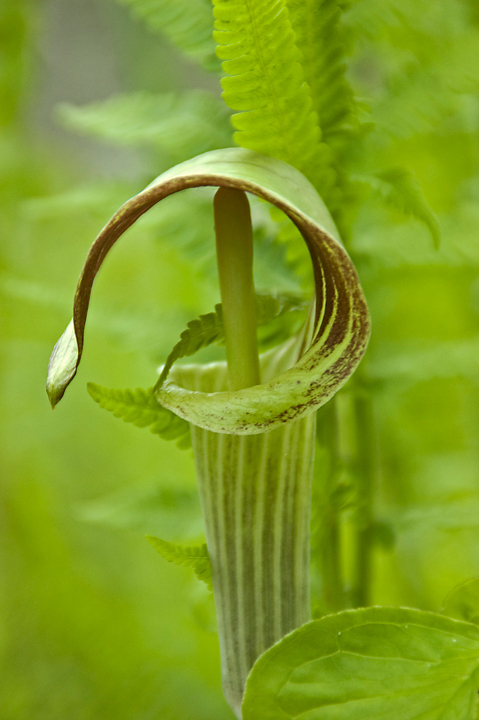 The Touch-me-nots are coming along and will soon shade out the Skunk Cabbage. It was an overcast day and rain was predicted to I decided not to bring a lot camera equipment. As is usually the case when I don’t bring my birding lens I see all kinds of birds. Song Sparrows and Catbirds seemed to be the most common. I saw a number of Eagles including the two on the nest (see earlier post). Mallards and Wood ducks were in the river. The American Redstarts are back as are the wrens and Orioles. It is difficult to photograph the birds this year because by the time they arrived the trees have leafed out beyond what they normally do. It looks like the coming weekend will be a great time to be on the trail. 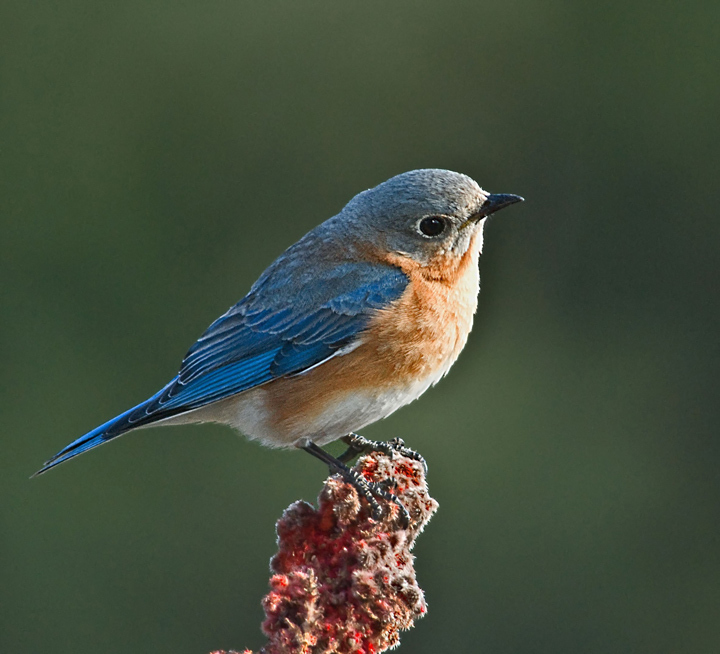 I discovered that Eastern Bluebirds love sumac berries by accident. A number of years ago I was walking through the woods in the middle of the winter discovered some Northern Cardinals and Chickadees feeding on sumac berries. I though it would be a great idea to cut a sumac branch and place it by my birdfeeders. I attached it to the feeder with some duck tape and waited. Seems that when they have a choice, the birds would much rather eat black sunflower seeds than sumac berries. I left the sumac attached to the feeder because it made a colorful prop for shooting birds against the white snow. 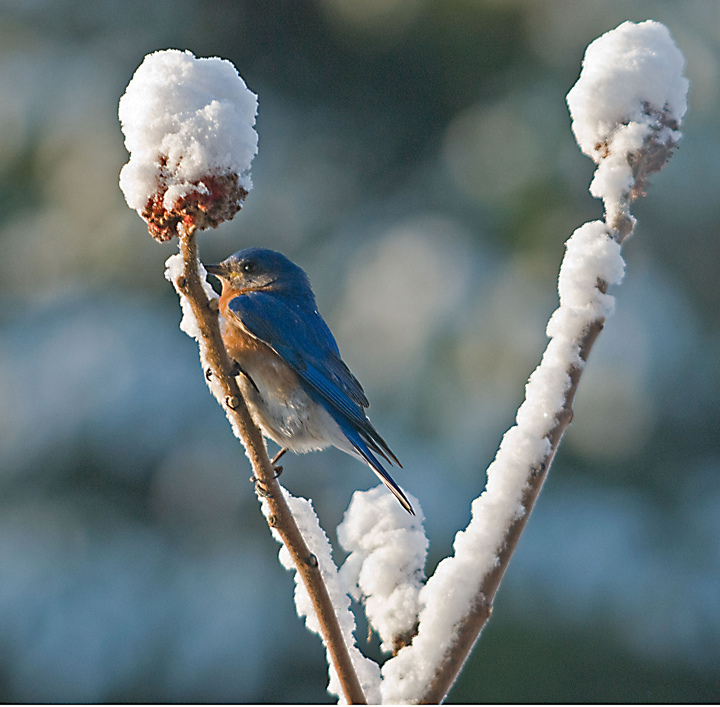 Before I had a chance to remove the branch the Bluebirds had returned from their winter vacation. Turns out they, along with Robbins, love sumac berries. For the last several years I have gone out in early spring and cut some sumac branches and installed them in an area where I can easily photograph the Bluebirds. I use a plastic fencepost with a spike on the end which makes it easy to plant and move the post. These are available at your local Farm and Fleet stores. I duck tape the branch to the fencepost. And wait for the Bluebirds to return. I usually keep a few branches stored in the garage so I have some replacements as the birds clean up the berries. There is a lot happening in the wetlands this weekend. Yesterday we saw the first of the Canada Geese goslings in the large pond. 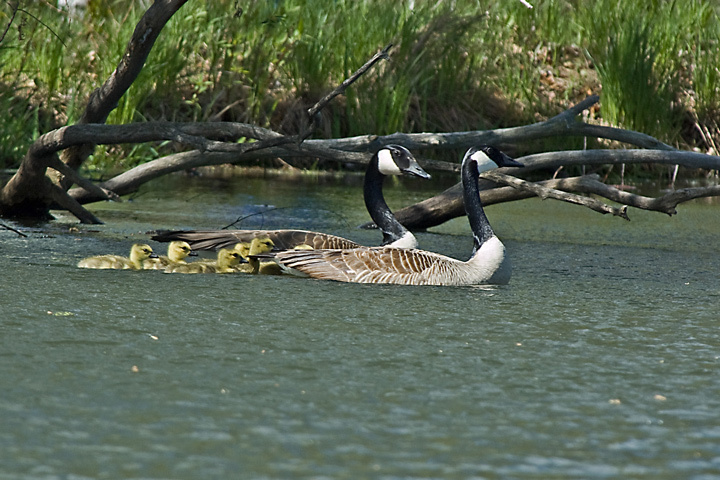 Overnight the geese also hatched in the first pond and the parents took goslings over to the large pond. This morning all of the geese were in the large pond with both pair of Geese starting out with six goslings each. The frogs are abundant in the wetlands. 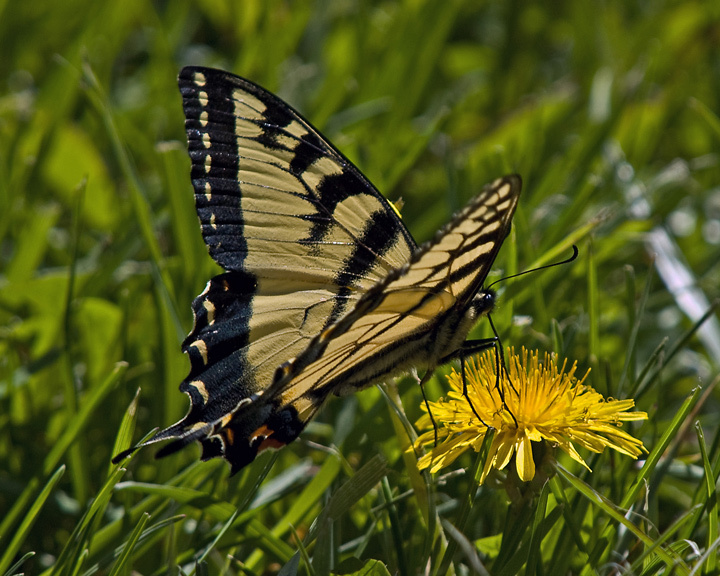 We also saw some Canadian Swallowtail Butterflies along the dikes. This morning we noticed a Woodchuck on he dikes. When we approached he ran up into a willow tree. Yesterday we made a quick trip up to Houghton, MI to pick up our son from school. We drove through the Porcupine Mountains on the way up and way down and made a few stops in the park. The wildflowers along south boundary road were outstanding. 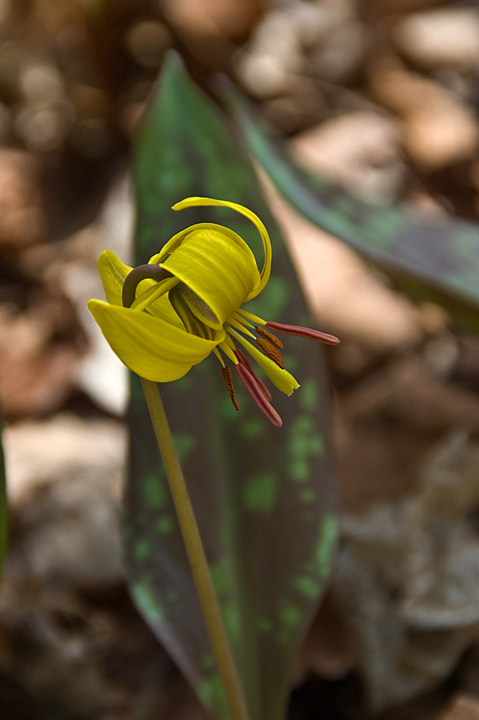 The woodland floor was covered with Yellow Trout Lilies. The sides of the road were covered with Spring Beauties and Dutchman’s Breaches. We also saw several large patches Marsh Marigolds. The weather was unusual for this time of year, lots of sun and 78 degrees. One very disturbing event occurred at the Bridge over the mouth of the Presque Isle River. I had just finished taking a few shots when I saw an animal fall into the river. It looked like it fell from the high cliff or a tree over the water on the left side. I couldn’t tell what it was but it was about the size of a Raccoon. It was quickly swept into the large pothole on the left. It managed to surface several times but it couldn’t get out of the whirlpool and eventually drown. 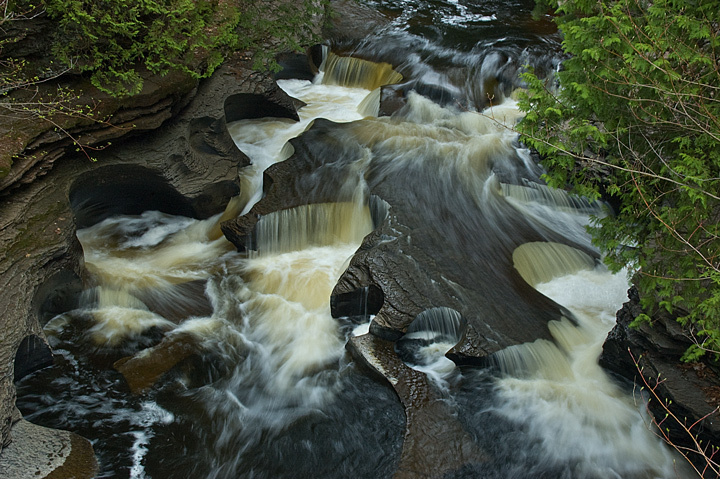 More spring photos from the Porcupine Mountains on my website.